Uncertainty over the driving forces of current W. African climate, such as the W. African monsoon, the role that land use change and vegetation feedbacks, and aerosols play complicate projections of change in precipitation in the region as a whole. The IPCC states that climate projections for W. Africa should be 'viewed with caution', suggesting the need for robust adaptation strategies that help to deal with current problems, and aren't reliant on specific projections of change. 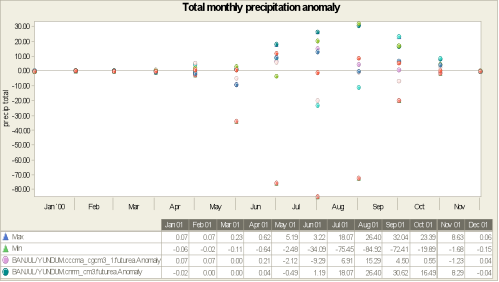 The graph above shows that the seasonality of rainfall will stay the same. For June the models are consistent in projecting little change or a decrease in precipitation and 6 out of the 8 models expect a moderate increase in rainfall in July. For the rest of the rainy season there is disagreement about what changes will occur, although some agreement that October rainfall may increase. Overall the picture is confused, with disagreement over an increase or decrease in precipitation. It is likely that the intensity of precipitation will increase. All of the models used are clear in projecting increases in temperatures (both maximum and minimum), and this is consistent with the trends in average temperature and also extreme temperature that have been observed over the last 50 years. 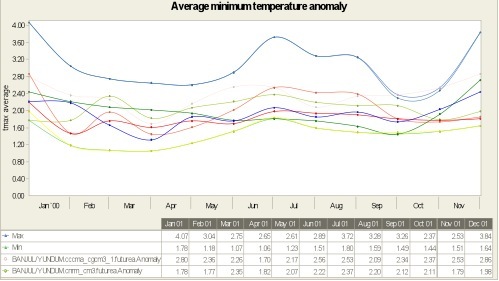 Average maximum temperatures are likely to increase in the range 1-4°C. The highest maximum temperatures are likely to increase in a similar fashion.